From warehouse operations to surgical operations, robots are lending a helping hand like never before. But just how nimble are they, and how far does the technology have to go for them to be fully useful in the industry? To explore this topic further, VLAB Executive Stefano Foresti is leading the coordination of panel on April 24 called “Robotic Dexterity: Grabbing the Brass Ring” at Stanford Faculty Club. It includes panelists from Grabit, Siemens, Sake Robotics and University of California Merced. With a rapidly improving ability to manipulate objects of all shapes and sizes, robots do have the potential to replace human operators with better accuracy, precision, and efficiency. However, challenges remain in building robots with highly nimble arms and legs. VLAB Blogger Michelle McIntyre recently chatted with Foresti to find out what it’s like to chair a panel, his philosophy on life and work, and what he thinks about our nebulous future with robots. Michelle: Stefano, you’ve been a respected senior VLAB leader for a few years. You even chaired the prestigious Founders Series in the past. What made you decide to chair a panel? Stefano: I joined VLAB participating on event teams and then chairing, which was a very fulfilling experience, learning about team building and teamwork. I was missing it. Michelle: What’s your day job? 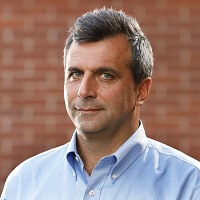 Stefano: I am the Director of Innovation at University of California Merced, creating partnerships with industry, and coordinating applied research programs and events, for experiential learning of students. Michelle: What was your first VLAB event and or meeting like, and what made you attend your second? Stefano: My first VLAB participation was a “pitch meeting.” There was a great inspiration and it was nice to connect with people. Michelle: How do you see AI and robots helping us today? How will they help us differently in the future? Stefano: It all depends on who “us” are. I don’t feel I get much help from robots, while industry seems to get increasing help. In the future, I hope that robots will be the new generation of tools that people interact with for what they need. Michelle: You have an impressive line up of panelists for April 24 including Siemens, UC Merced and Grabit. How did your team recruit them? What is the secret to success? Michelle: What is your philosophy about life and/or work? Stefano: Think well to work smart and enjoy life. Livestream tickets are also available. If you have an awesome panel idea, please attend a monthly pitch & planning meeting! These days they typically take place every first Tuesday of the month in Palo Alto. Michelle McIntyre is a VLAB Blogger and Silicon Valley PR Consultant. She’s @FromMichelle on Twitter.